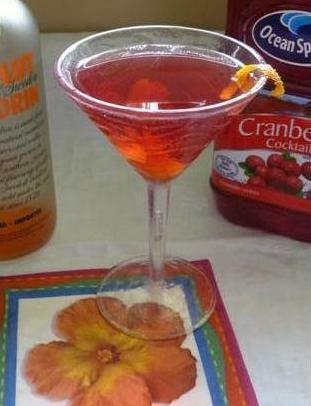 This cranberry cocktail and ABSOLUT MANDRIN drink is a wonderful way to cool off on a hot summer day. 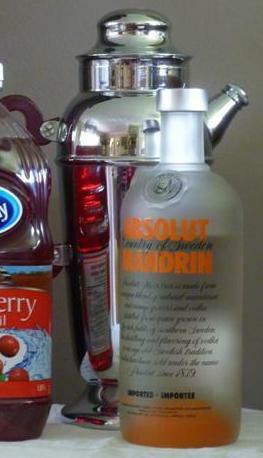 The tartness of cranberry was made for ABSOLUT MANDRIN. It is also perfect for Thanksgiving and Christmas gatherings, as a cocktail before dinner or as a sipper to have with your turkey. 1. Fill a cocktail shaker with a few ice cubes. 2. 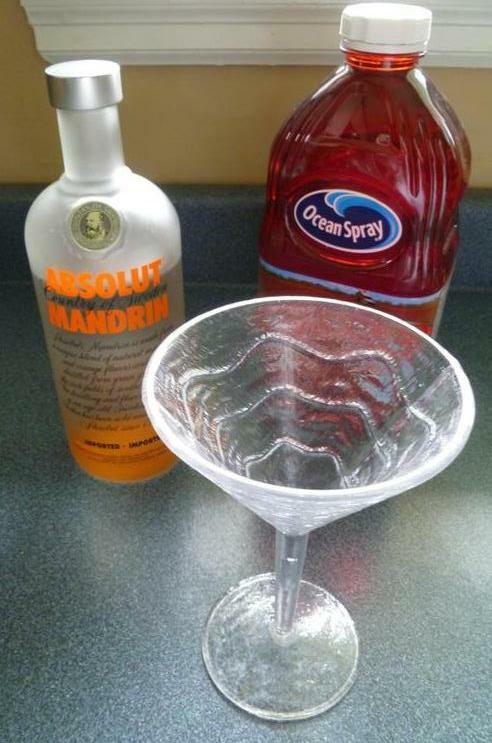 Pour in the ABSOLUT MANDRIN and the cranberry juice. 3. Shake well until the shaker is a little frosty on the outside. 4. Strain contents into a 6 ounce martini glass. 5. Garnish with a curl of orange peel or pop in a couple of frozen mandarin orange sections. For Thanksgiving or Christmas, add a couple of frozen cranberries or ice cubes that have cranberries in them. Nothing to prepare in advance unless you count making ice cubes. To freeze the (optional) mandarin orange sections, simply remove them from their syrup and place them on a cookie sheet one by one. Pop the cookie sheet in the freezer and you are all set. According to the ABSOLUT website, it was not until 1979 that the V&S Absolut Spirits company started exporting vodka to the United States. Despite this late entry into the export market, ABSOLUT’s success is based on over 400 years of vodka-making tradition in Sweden. In the late 1800s, a man called Lars Olsson Smith, 'The King of Vodka', came up with a new way of purifying vodka. He then went on to coin the ABSOLUT name based in part on the Swedish name for 'absolutely pure vodka'. Smith registered the brand name in 1879, and the company continued to work on their product, refining and purifying it further. Prior to entering the export market, the company recognized that they needed to develop a new bottle. The origin of the bottle design we know so well today was an old pharmacy bottle that was found in an antique shop. The company loved the design and the product was launched in its new bottle. Ready for the export market in 1979, in five short years ABSOLUT was available in 18 countries, and by 1985 it had become the number one imported vodka in the United States in terms of sales. ABSOLUT is now one of the most recognized and best-selling vodka brands in the world, second only to Smirnoff. The Absolut Company has worldwide responsibility for the production and marketing of ABSOLUT VODKA, MALIBU, KAHLÚA, Wyborowa, Luksusowa and Frïs. 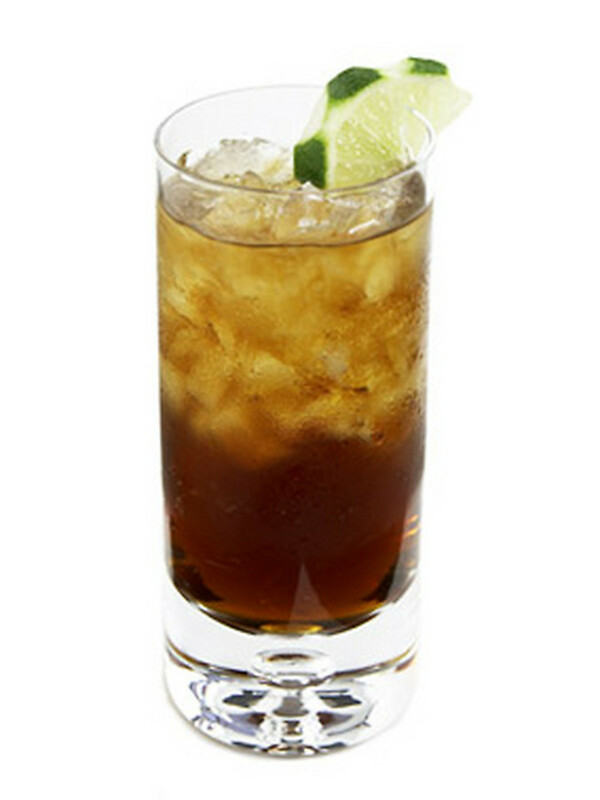 MALIBU is the number one coconut-flavored rum in the world, sold in more than 150 countries, while KAHLÚA coffee liqueur is the world leader in its category. The ingredients used in ABSOLUT are wheat, enzymes, yeast and pure well water. The flavored versions of ABSOLUT use only natural ingredients including berries, fruit and spice. Wheat is fermented to create alcohol, and undergoes purification and distillation. ABSOLUT still uses the process developed by Lars Olsson Smith called continuous distillation; ABSOLUT is distilled hundreds of times until all of the impurities have been removed. Every bottle of ABSOLUT is produced in Åhus, Sweden. Who hasn’t seen these catchy ads? In 1985 Andy Warhol painted the ABSOLUT VODKA bottle, and since then hundreds of artists from all fields of art have worked on the various advertising campaigns. The photography and the images from these campaigns have become iconic, and posters, books and other items are available for sale. In 2007, the ABSOLUT brand decided to launch a new advertising campaign 'In an ABSOLUT world'. The glasses are just too cute! 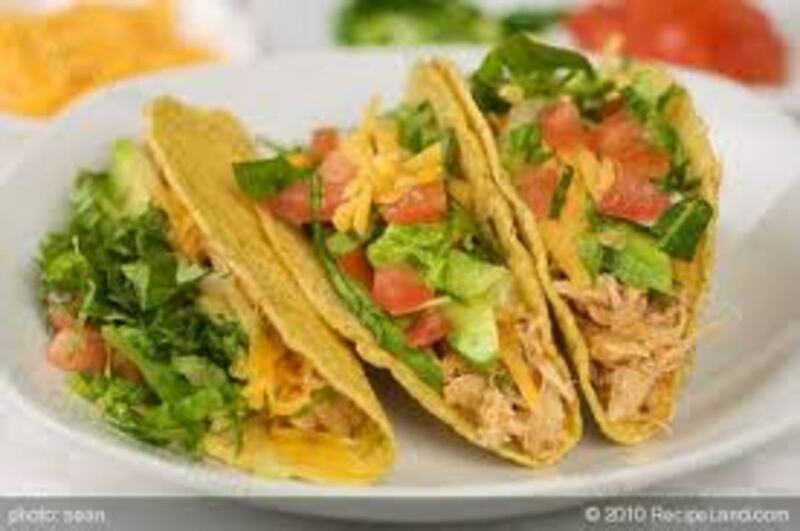 Great article - I'm pinning it, adding it to stumbleupon and voting up! Thank you for your comments, and you are welcome! This is a very tasty drink for sure. A really cool drink for summer! Looks so tempting and the instructions are so well explained. Hi midget38 you are so welcome. It is really tasty and the color makes it very festive for the holidays. Delicious and I am definitely sharing this, especially with Christmas upon us once again. Thanks for sharing, Kaili! Hi Jo and thank you. It is easy to make a pitcher of this wonderful beverage if you have friends over too! I now know what I'll be drinking this Christmas. Looks very refreshing, and I love the history. love the hub-- love the photos and love just the idea of that wonderful cranberry, mandarin martini served in that elegant glass.And who knew all that interesting stuff about Absolut? Voted up and awesome. Love the glass! I've been recently bitten by the Cocktail bug and am learning all about them. Have been wanting to but a set of martini glasses, just have to find the time to go shopping! I bet this has a great kick to it, and I love the color!! Oh, another fine drink recipe I must try this summer. I thought I already commented on this yummy treat but, I guess I didn't. I like this very much! You are most welcome Mhatter99! Yeah...will sure do! looks very tempting! Hi M...thanks for the visit. Give it a try! It is soooo good. 5 stars for this! Great tips!